Moto2 & 3 races online and on Red Button 01:55 - 04:05 GMT; MotoGP race on BBC 2 04:30 - 06:00 GMT and online. Repeated on BBC 2 12:45 - 14:00 GMT. Australia is about to go Casey Stoner mad this weekend as the reigning MotoGP champion races in the country for the last time before he retires. The 27-year-old Australian has won his home Grand Prix in each of the last five years and is desperate to make it six. There is a sell-out crowd waiting to see Stoner, and he is even having Turn Three of the track named after him. An honour indeed. But, while I think he is more than capable of pulling it off on Sunday, the Repsol Honda rider has a formidable obstacle sharing his garage. Dani Pedrosa is on such a roll at the moment that I think he will beat Stoner in what promises to be an excellent race between them. The Spaniard has picked his game up so much at the moment, he is a different person. Apart from the battle between Stoner and Pedrosa, throw in the fact that Jorge Lorenzo can win this year's championship with a win and we should have a thrilling race from flag to flag. Stoner has targeted this race from a long way out. He could have packed up a few months back when he broke his ankle but with the sole intention of winning this race. He is a very determined man and he will be giving it everything. Pedrosa wants to go to the last race in Valencia on 11 November with a chance of winning the title, no matter how small, and he can do that if he wins. 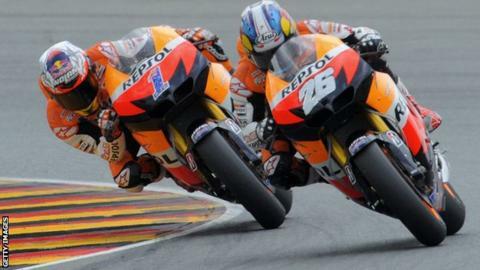 If Stoner is able to finish ahead of Lorenzo as well, then all the better from Pedrosa's perspective. There is absolutely no prospect of any team orders designed to help Pedrosa win though, and if anyone in the Repsol team was brave enough to suggest such a thing, Stoner wouldn't listen anyway. How could you possibly tell him to finish behind his team-mate? He is not after a contract for next year; there is no way of putting any leverage on him. And, quite rightly, Pedrosa has already said he doesn't want any help from Stoner. If he is to win the championship then it will all be down to his own work. Lorenzo can wrap up the title with a win, but he will also probably be happy to finish third this weekend. He is riding professionally. The forecast isn't too clever again so we may not be in for hot sunny weather. The difference is that if it rains at Phillip Island it will be about 10C due to the circuit's coastal location. When the sun comes out Phillip Island is probably the most beautiful circuit you could ever go to. It has no silly chicanes, it has very fast corners and plenty of undulation. It has the Pacific Ocean right behind it, it is how you would design, draw and position a circuit if you could. It's right on the cliff edge. It's beautiful. Let's hope we have a good race and a title fight which will go to the wire.